j'ai suivi la procédure pour créer un pdf mais en cliquant sur "continue" la fenêtre se ferme et rien ne se passe. This should close and automatically download the PDF version of your form. Please check your download folder to see if your PDF was downloaded correctly. If not, please let us know and we will be glad to take a look. In first i would like to apologize for my english. I don't understand why this function doesn't work with my forms. I did everything listed in the users guide "How to Create a pdf form" but when i click on the "continue" button, the window closed and nothing happen (like i said, the download folder didn't contain any jotform pdf). Please could you help me ? I just want to obtain my forms in a pdf format to be easily printable. I'm looking into the issue. Please allow me some time to check this up and get back to you with relevant information. We had some issue with generating PDFs and this has been resolved now. 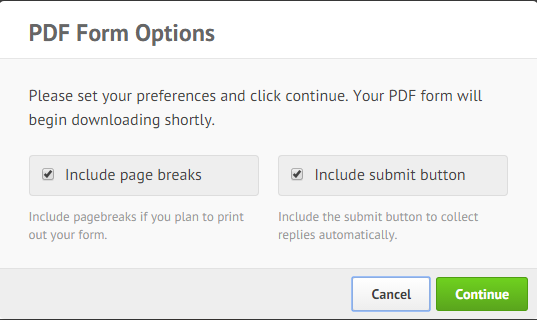 You should be able to generate the PDF forms without any issue. Could you please check once again and let us know if the issue persists? i'm sorry but it still doesn't work at this time (i checked it one hour ago). Sorry for this inconvenience. To assist you better could you please indicate the form in question. This will help us analyze the problem and give the best answer. It is form that i maked "Evaluation module 1"
Sorry for the inconvenience. I have just reviewed your form and noticed that when I try to create a fillable PDF, I get an XML error. I am assuming that you are getting this error as well. Unfortunately, your form is pretty big and is the reason you are not able to create a PDF.